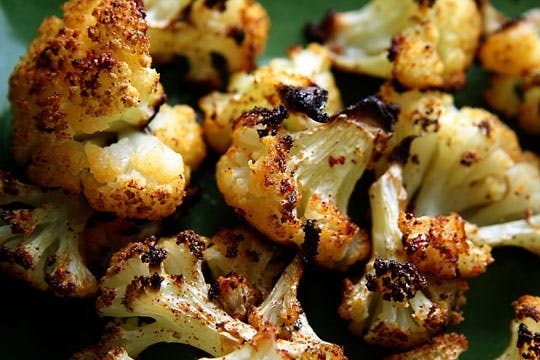 One of my favorites is cauliflower florets and roasting in a piping hot oven brings out their natural sweetness. And here is the thing; the simple ingredients of olive oil, salt and pepper create a fabulous vegetable dish. Toss the cauliflower in olive oil until all the florets are coated lightly. Easy to Prepare Tip: One method I find produces great results is to put the olive oil in a plastic storage bag, add the cauliflower and shake gently. Place the florets in a single layer in an oven-proof baking dish or on a cookie sheet, dust with salt and pepper. Keep uncovered and roast, stirring and turning over occasionally, until tender to a fork and lightly browned, 25 to 35 minutes. Don’t pile your vegetables on top of one another. Though the simple roasted cauliflower florets easily stand alone as a great veggie dish, with the addition of one or several ingredients such as garlic, lemon juice, cheese or any number of your favorite spices you can create your own special dish. I love cauliflower prepared this way! Thanks Ken!